Dezeen promotion: a 9,000-year-old axe imprints the dark concrete panels that clad this storage and research centre for the Tyrolean State Museum in Austria, designed by architecture studio Franz&Sue. 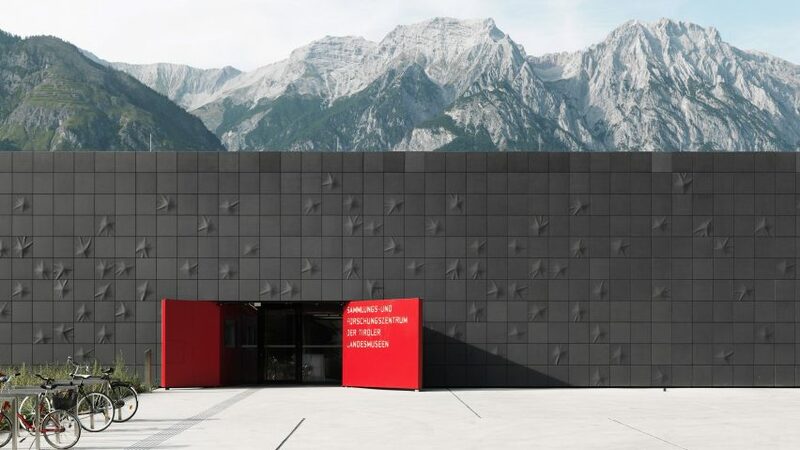 Vienna-based Franz&Sue designed the archive facility near the city of Innsbruck, which is clad with custom made panels created by facade manufacturer Rieder, to house the collections of the Tyrolean State Museum. The valuable and sensitive cultural artefacts include a 3,000-year-old mummy, stone-age tools and instruments from violin maker Jakob Stainer. To ensure constant climatic conditions for the storage rooms, the building is embedded into the earth. Only the upper storey is visible above ground, with two basement levels containing the majority of the building's storage facilities. Above ground, the rectangular building is a dark monolithic form entirely clad in a dark grey glassfibre-reinforced concrete skin. To tie the building's facade to the activities taking place inside, the facade panels of the skin are imprinted with one of the oldest items in the collection – a hand axe from around the seventh millennium BC. "The facade material tells a story of preservation and conservation. At the same time, the haptic of the concrete creates a certain attraction," explained Erwin Stättner founding partner at Franz&Sue. "With the elaborate design of the building envelope, we want to connect the old with the new and make it distinguishable." The imprinted panels, which measure 60 square centimetres, are irregularly combined with smooth panels made from the same glassfibre-reinforced concrete. The pattern formed is a metaphorical reference to the locations in the region where the artefacts in the collection were discovered, with the joint lines between panels symbolising grid lines on a map. During the industrial manufacturing process each panel is created by placing the 13-millimetre-thick glassfibre-reinforced concrete over a shape created from the axe. As the concrete hardens it forms a unique folded design, meaning that each panel is an individual. The building also contains offices and work rooms for 35 employees that need access to the collections, but require daylight to carry out their work. To provide facilities for these staff, a central atrium cuts through the building, with the workrooms arranged around it. More information about Rieder's glassfibre-reinforced concrete panels can be found on the company's website. Images are courtesy of Rieder Group and Ditz.